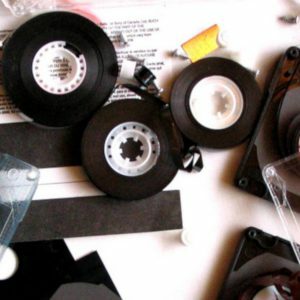 This workshop, led by Jon Saklofske (Acadia University) and Deanna Fong (Simon Fraser University) reflects upon the materiality, affordances, and constraints of cassette tape technology through techniques of revisualization, remediation, and remix. Focusing on the complex interplay between live sound and its recorded document, this workshop asks: What does the recording do to sound, its temporal and spatial contexts, its origins, and its meaning potential? How does the medium shape our interaction with traces of the live event? What happens to meaning—what can ostensibly thought of as the signal—when it is distended and modulated across textual and sonic media? The first part of this workshop is a facilitated discussion designed to interrogate assumptions about the compact cassette as medium: its sound, its cultural significance, its technological impact. After this discussion, Saklofske and Fong will showcase some of their experiments in defamiliarizing the cassette, and then participants will be invited to reimagine the cassette object using blank tapes, recording devices, and a variety of visual and textual material. This event draws on the Press Play series of workshops designed by AMP Lab director Karis Shearer (University of British Columbia Okanagan) and Deanna Fong (Simon Fraser University).